Since spring is now here, let's talk a moment about the wind. It is at this time each year that we can expect to have winds blowing for what often may seem like eternity, and sometimes they'll be blowing rather hard. When it's really windy like this, I like to locate active bait that is showering out of the water. I'll make my approach to the proper bait-laden area as slowly and as quietly as possible. I find that on some days the bait will be more widespread, and that the bait fish are located primarily in dirty water against the windward side. But on other days, I may find the bait to be in clear water that's located along the leeward side. I idle the boat upwind of where I choose to begin my wade session, and once I've gotten out of the boat, I try to concentrate my efforts to within a 100-yard radius of my starting point. Now then, in determining whether I'm going to fish the windward side or the leeward side of any particular shoreline or back lake, my decision always comes back to whether or not I have located bait. Granted, finding the bait can be difficult, but the windy conditions that are so commonly characteristic of this season may just prove to be one of your biggest obstacles of all. Learning where and when to fish with the winds often determines whether or not I get to brag at the end of the day. Adding to wind difficulties are the other intrinsic obstacles which inherently accompany the upcoming months of April and May – transitions in water temperatures, air climate, and tide levels. And although day-to-day top water results seem to vary quite a bit, it will only be a short time before avid top water enthusiasts will be able to enjoy the love of their chosen area of expertise on a daily basis. April brings with it the advancement of much warmer air and water temperatures and sets off a biological alarm clock within trout which signals to them that this is the start of their annual spawning season – an event held primarily over sandy shorelines. So, remember that it's at this time in the year when you will not be restricted to finding prized fish just over mud and grass structure – if the mud of the back lakes becomes too much for you, simply scout nearby sandy shorelines for the presence of bait. But regardless of where you find yourself wading, try to first remember a couple of the springtime rules. One is that you should always make it a point to wade at a slow pace. And another rule is that you should attempt to blanket an entire area with casts in different directions prior to making any moves forward or sideways. When I'm fishing with a group of people, I like the group to move and stop with me. And if my group is catching fish, I always tell them to stay right where they are, because every time you take steps you tend to create clouds or you could possibly spook the fish. Also when fishing the sand in April, I like to slow the rate of my retrieve to the point where my plastic bait is just "crawling" along within the lower water column because this is where area just above the bottom that large female trout prefer to lay when spawning. The small male trout fertilize the egg's that the females have ejected upon the sandy bottom, and because of this I've often found that the smaller male trout hang suspended above the big females, thus resulting in me catching smaller trout whenever I happen to be working my lure in the middle or upper water columns. Just as-like when I'm looking for the presence of bait on windy days in backcountry lakes, I'll need to locate nervous bait while targeting the sandy shorelines. I'll look for small, round slicks popping up near the bank, and I'll concentrate on points that extend out into the bay further than others – openings that lead into the back lakes that have protruding points are definitely good areas to fish. I also like to wade in areas where the bay bottom is configured with pronounced undulations, as big trout will often lie in the associated wash-out areas while waiting for an opportunity to ambush unsuspecting baitfish. With air temperatures starting to climb between 80 and 90 degrees, look for the sandy shorelines to heat up during late April and early May, especially during the middle of the day, or late in the afternoon. And as usual for this time of the year, the top water action will also begin to heat-up as April progresses, so now is a great time to blow the dust off your favorite surface walker and get to work. If when tossing your favorite surface plug you find that the fish appear to be interested, but that they just aren't inhaling the lure, try experimenting with different retrieves. I like a steady walk-the-dog retrieve until I get a blowup, then I let it sit for a few seconds and just give it a quick twitch, or two (9 out of 10 times they'll come right back to it). There's always something fun going on around the Lodge, and this spring is no exception. Do you have the best recipe ever? Then enter Bay Flats Lodge 1st Annual San Antonio Bay Recipe Challenge. Just email your best original recipe to [email protected] and you could win a free trip for three people to Bay Flats Lodge. The winner will receive lodging and meals for one night and full day of fishing with one of our professional fishing guides (a package valued at $1,200.00). 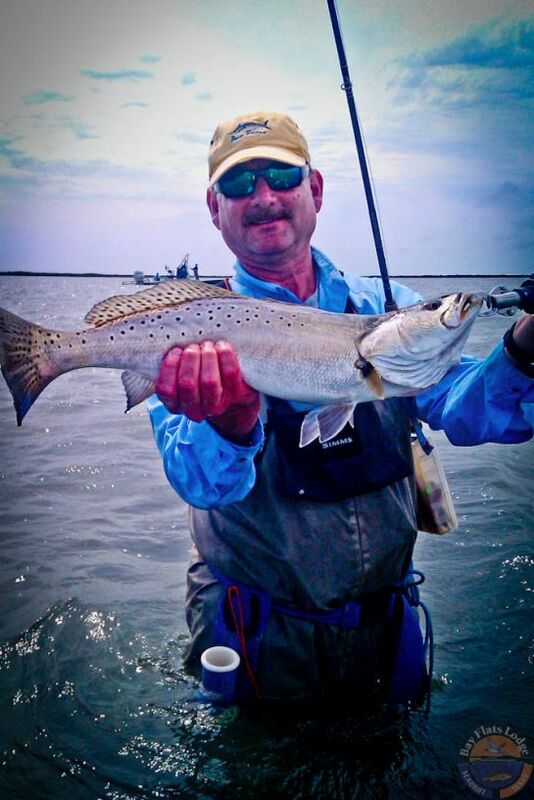 Remember to practice CPR, "Catch, Photo, and Release", whenever possible on trophy Trout and Reds…Guide Chris Martin, Port O'Connor/Seadrift region. 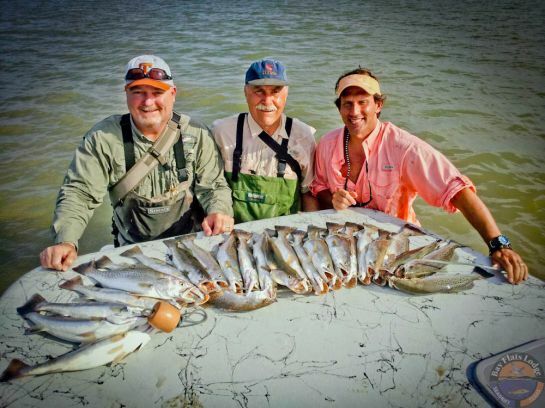 I fish in East Matagorda Bay and was wondering where the trout spawn in this bay. I know of a few sandy spots on the South shoreline that I have been wading slowly and extensively with no luck using Corkies. Your thoughts?